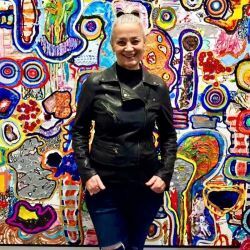 Born in Holland in 1953, Carla Tak is a Canadian artist known for her intricate and involving abstract works that use colour, impasto and gestural force to convey private associations. Tak was raised in West Vancouver where she developed a strong, independent point of view from an early age. At 12, she took an intense interest in Picasso’s art and creative life. At 14, she quit high school to attend the Bavanah Art School and at 15 moved into a loft in Gastown when the area was still derelict and home to many artists and the growing countercultural scene. The following year, Tak decided to move to Los Angeles with an American sculptor twice her age. Eventually, she’d also live in New York and Florida and become a mother. For almost three decades, Tak’s creative artistry remained nascent while life intervened. Tak didn’t start painting again, until she was 50. Drawing on years spent in psychotherapy and inspired by the bold abstractions of the postwar New York School, Tak began exploring in non-objective form the psychological drama of her own personal experiences. Tak employs her palette knife, brushes and hands as the means to manifest emotions, perceptions and memories. The aim is self-revelation through gestural release. The personal nature of Tak’s abstractions is further evidenced by her expressive use of script - a calligraphic style that came about through her many years of journal writing. Often rough and raw, Tak’s art emerges from a deeply felt awareness of her subconscious spirit to achieve lyrical beauty. In her studio, Tak often uses classical music to help ease the flow between the eye, mind and hand. Her process is intuitive and physical - mindful but open to spontaneous action. Having worked as a teenager with Fritz Perls, the German psychotherapist behind Gestalt Therapy, Tak values the opportunity for an acute awareness of sensation to come over her. Several paintings may be developed simultaneously but each is resolved at their own pace - some in days or weeks while others require months of attention. Tak titles each piece according to the year and order of their completion - a system that affords a chronological view of her creative history. While intimately personal, Tak regards her paintings as “open spaces of discovery” and allows that each piece is subject to the viewer’s own unguided associations. Carla Tak maintains a full-time studio practice in Vancouver’s historic 1000 Parker Building where she works six days a week unless she’s visiting her three grandchildren in Los Angeles. Along with her husband Chris, Tak is an avid patron of the arts and private collector. Tak is represented in Los Angeles and Palm Springs as well as in many private and public collection.